in a particular frame target="TRLX_Middle"
CSB 4 and CSB 5 have the TARGET option build into the link properties box. Choose which one suits your needs best. BLANK option is perfect for downloadable files. 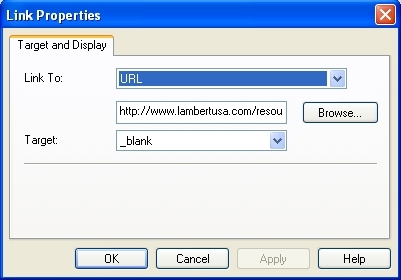 Upload them to your host then use a URL style link to open them in a new window. CSB 3: Does not have the dropdown choice but you can add the TARGET statement behind the link itself. Just add " target="blank behind the link, leaving off the final " because the program will put it in for you. You can also add a coment or statement about your link/image. Read more about hovering tool tip here.